The Company never forgets its mission, however is still improving its branding with global partnerships, ensuring the supply of the Genuine Spare Parts: Ex Works or wherever Free on Board, Free along ship, ensuring still more than a prompt answer. Navalcantieri Italia is Spare Parts Dealer & Service of Yanmar. 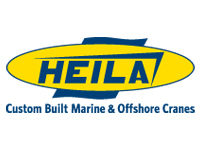 Navalcantieri Italia S.r.l is Dealer of Heila spa for South of Italy, Malta, Lybia, Nigeria, Congo, Angola. Navalcantieri Italia S.r.l. is Pres-VAc Service & Repair Centre (SRC), sole authorized point of service and repair of the Pres-VAc products in Italy. Navalcantieri Italia S.r.l. is BOSIET Certified (Basic Offshore Safety Induction Emergency Training), this patent qualify Our technicians to work safety on board Offshore Platforms Worldwide. Navalcantieri Italia has appointed European Yanmar Service Dealer for Yanmar Large Engine Medium and High Speed Range.